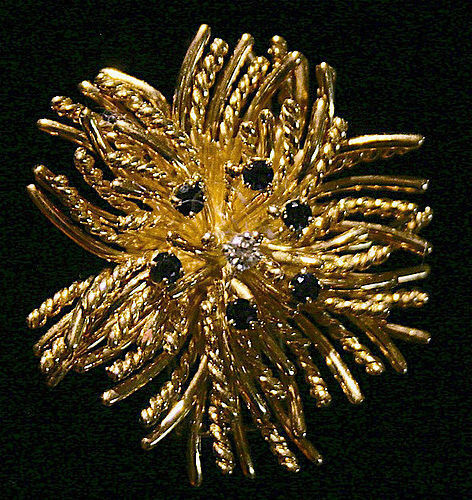 Tiffany & Co. 18Kt yellow gold sea anemone brooch pin pendant set with a central round diamond surrounded by six blue sapphires. Size: 1 1/2 inches diameter. 14.9 pennyweight total weight. 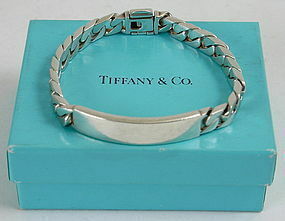 Stamped Tiffany & Co. This item may be worn as a pendant, suspended from a loop, or worn as a brooch with hinged double pin back. A fabulous example of Tiffany design! 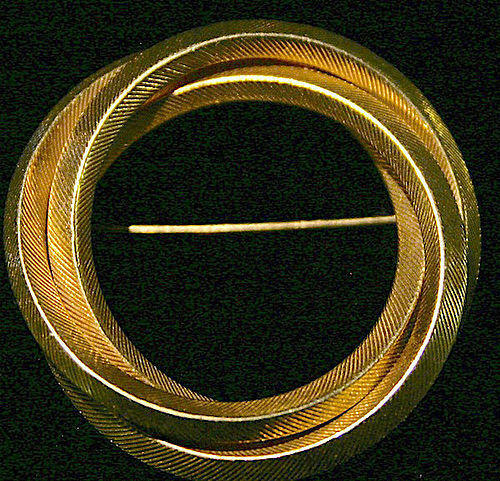 Tiffany and Company 14K yellow gold circular brooch formed as an intertwined love knot with pin back. Made in Germany for Tiffany & Co. Mid 20th century. Weight: 4.9 dwt. Size: 1 1.2 inches diameter. Signed on an applied oval tag: TIFFANY & CO. 14K GERMANY. Antique finely inlaid micro mosaic plaque with cocker spaniel. Mid 19th century. No cracks. 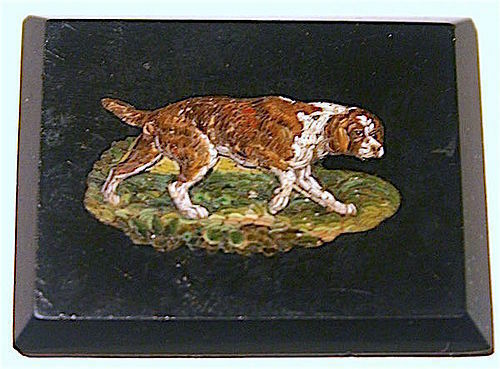 A very early Roman micro mosaic plaque of a spaniel fashioned from miniature colored glass tesserae set in beveled black onyx glass, in subtle colors of green, brown and white finely fitted to create a most realistic depiction. Originally made to be set as a brooch but never mounted. Size: 1 1/4 inches x 1 5/8 inches. 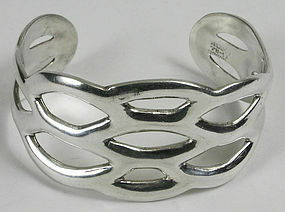 Vintage Mexican sterling silver cuff bracelet with openwork design. Circa 1960s-70s. Size: 2 5/8 inches x 2 inches x 1 3/8 inches wide. Weight: 1.26 troy ounces/39.5 grams. Hallmarked: MEXICO, TB-17 925. Maker's mark obscured. 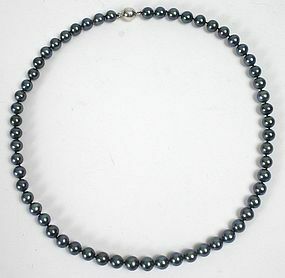 Single strand necklace with 58 peacock colored freshwater pearls. Length: 18 inches. Pearls size: 7mm. Magnetic clasp. Appraised replacement cost of $450. 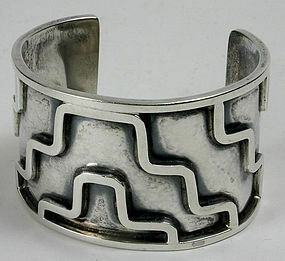 A modernistic cuff bracelet in heavy sterling silver, designed by Lico, a master Mexican silversmith who originally worked for William Spratling and who is known for his geometric designed jewelry. Circa 1950's. Weight: 78.5 grams/2.5 troy ounces. 2 3/4" length x 2 1/4" deep x 1 5/8" wide. Stamped on the inside 'HECHO EN MEXICO 925 LICO' and with an eagle 1 mark. This heavy bracelet is adorned all over with a stepped motif. Excellent condition. Tiffany and Co. leaf pendant designed by Angela Cummings in 18K yellow gold, with the tip fashioned in Platinum and set with five round diamonds, suspended from an 18K yellow gold 18 inch chain. The leaf pendant measures 1 1/4 inches in length. Marked on the reverse 'Tiffany & Co. 18K Irid.Plat' Excellent condition. No box. Vintage ladies Rolex oyster perpetual date wristwatch. Stainless steel and gold case, fluted gold bezel, black dial, cyclops lens over date aperture, self winding movement. 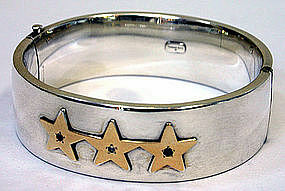 Original jubilee model two-tone stainless and gold link bracelet (62523D.18). 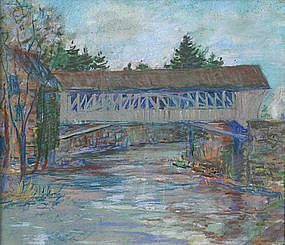 Purchased in 1980s. Running condition. No box. Antique Jabot sword pin replica of a Regulation 1821 Model U.S. Infantry Officer's sword, unmarked but testing as 14K gold, with white enamel, four round diamonds and a detailed eagle head pommel. Circa 1850-1860s. Size: 4 inches length. Weight: 3.9 dwt./6 grams. Excellent condition. 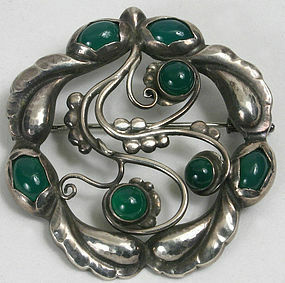 Georg Jensen, Denmark, .830 silver and green chrysoprase brooch, No. 159. Circa 1915-27. Size: 1.75 inches diameter. Stamped with early Georg Jensen marks. Excellent condition. Tiffany and Company vintage I.D. bracelet in sterling silver with curb link chain. 8 inches length. New retail price at Tiffany's is $500. No monogram. Tiffany and Co. wide sterling silver bangle bracelet adorned with three 14kt gold stars, each set with a single diamond, ruby or sapphire. 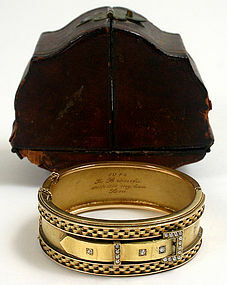 The bangle is hinged with an expanding safety clasp. Marked Tiffany and Co. and sterling. Size: 2 1/4 inches x 2 1/8 inches (interior dimensions.) Excellent condition, no monogram, no dings or repairs. Hinge and clasp work perfectly. 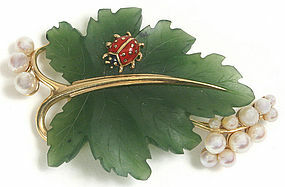 Estate jewelry pin/brooch fashioned in the form of a grape leaf with cultured pearl grapes and enameled lady bug, set in 14kt yellow gold, with carved green hardstone leaf. Excellent condition. Size: 2.25" length x 1.5" ht. Tiffany & Company vintage gold floral pin, fashioned in 18kt. 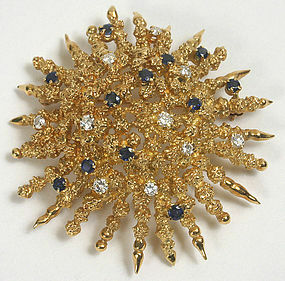 yellow gold, set with 12 blue sapphires and 10 round diamonds. Weighs 17.8 dwt. (including stones). Excellent condition. Size: 2" diameter. Tiffany & Co. bangle bracelet in sterling silver adorned with three 14kt gold stars, each set with a single gem stone: sapphire, diamond and ruby. Includes original Tiffany box. Size: 2.5" x 2.5" x .75" wide. (inside dimensions - 2 1/8" x 2 1/4"). Excellent like new condition.